A glance at a topographical map of Turkey eveals that this is a country of mountains. Rising from all four directions, mountains encircle the peninsula of Anatolia. A part of the Alpine-Himalayan Mountain range, Turkey has mountainous regions with different geological formations.The North Anatolian range skirts the Mediterranean shore. Turkey’s magnificient mountains and forests are mostly undeveloped, existing as wonderful natural preserves for an extraordinary variety of wild life, flora and fauna. Two of Turkey’s most famous peaks are volcanos, both inactive,Mt. Erciyes in Kayseri in Central Anatolia(3917 m) and Mt. Agri; (mt. Ararat 5137 m) in the east. Other mountain ranges are the Rize Kaçkar (3932 m) in the eastern Black Sea region, Nigde Aladag; (3756 m) in the central Taurus range and the Cilo and Sat mountains (4136 m) near Hakkari in the eastern Taurus. The mountainous nature of the country has inflounced its cultural evolution. For centuries, nomads and semi-nomadic peoples have moved yearly to the fresh pastures of the higher elevations in the summer. 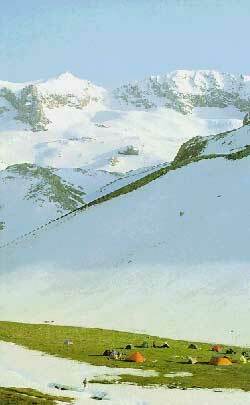 These alpine medows, called yayla, house nomadic people whose traditional culture is still preserved. For climbers and those interested in the geography of mountains, Turkey offers a wealth of exploration. Glaciers, volcanos, and peculiar geological formations such as karst prove irresistable to researchers and students of the geology. The challenging terrain offers opportunities to aficionados of outdoor sports, who find the most interesting experiences on the mountains of eastern, central and southern Turkey. A list of resources to aid an expedition, is found in the rest of this text. Rising at the borders of Turkey and Iran, Mount Ağrı, an inactive volcano capped year round with ice and snow, rises to 5137 meters. The Old Testament records that it was on this mountain that Noah’s Ark came to rest after the great flood. Southwest of the mountain, the Little Mount Agri (Ararat) reaches up to 3896 meters; the Serdarbulak lava plateau (2600 m) streches out between the two pinnacles. Climbing the spectacular Agri is a challenging and rewarding experience. In the summer, the weather in the area and on Mount Agri is sunny, warm and dry. However, in the winter and spring, cold and harsh conditions prevail, and mountain climbers occasionally face blizzards and turbulent weather. July, August, and September are the months when most world mountain climbers come to the area. Climbing up Agri is most enjoyable during this period. However, despite the usual sunny and clear weather at that time of year, high altitude mountain weather swirls around above 3000 meters. The southern side of the mountain offers the easiest and safest climb to the summit. With this route one has access to the best route communication and transportation facilities and it is safe. 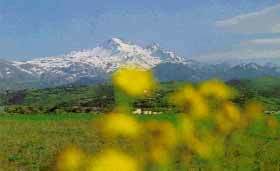 It is not recommended to climb Mount Agrì alone and without a guide. The Trabzon- Erzurum- Iran International Transit Highway, an asphalt road skirts the western and southern flanks of Agri before leading into Iran. Dogubeyazit, 270 km from Erzurum and nearby Igdir, the two closest towns to the mountain, are located on this route. Planes, trains, and buses connect Erzurum with Ankara. The area surrounding Agri has retained its natural beauty. The local population still engages in a traditional life styles. In the summer months the villagers move to the yayla, the summer pastures, to find fresh grazing for their herds of sheep, goats, cattle and horses. Women continue to weave carpets and kilims in time _ honored designs; Village of Ortulu is particularly renowned as a center of beautiful handicrafts. Other nearby tourist attractions include the Ishakpasha Palace, a fabulous 18th century castle of a local potentate, and the meteor hole near the Iranian border. The Cilo-Sat mountains, within the southeastern Hakkari province are the eastern extension of the Toros (Taurus) mountain chain which stretches from west to east along Turkey’s southern boundaries. The mountain range forms the western section of the Himalayan mountain belt. At 4136 meters, the Uludoruk (Re_ko) summit is the highest in the Cilo mountains; Catalkaya(Samdi), which rises to 3794 meters crowns the Sat mountains. Resembling the Alps both in general appereance and glacier topography, the Cilo_Sat mountains are the areas in Turkey most affected by glaciers. The high altitudes of the mountains testify to the effects of glacial formation and water erosion. Of the ten differently shaped glaciers, the largest, Izbìrak, measures five kilometres in length, 500_600 meters in width. It reaches up to 100 meters in depth. A wide arid expanse stretches across the southern base of the mountain range. The highlands, in contrast, receive plentiful precipitation during the winter months. In between crests and summits, fertile green valleys dotted with rural settlements, enjoy a temperate climate that makes them ideal for wine and fruit agriculture. Above the low valleys, alpine meadows blanket the mountain slopes at altitudes between 2000 and 3100 meters. Herds of domestic animals, the raising of which makes up the primary economic activityof the region, graze on these pastures. 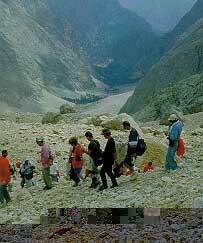 Arduous and elevated summits, high glaciers, glacial rivers and fast moving streams combine to make the Cilo_Sat mountains both a fascinating geographic and geological site of worldwide importance and a national park of spectacular beauty. The best time for summer excursions is during June, July, August and September. For winter climbing February and March are the most suitable months. To reach the Cilo_Sat mountains, travel to Van from Ankara by road, rail, or air and then follow the 245 km long highway to Hakkari. Serpil village offers one route for an ascent of Uludoruk. A vast plateau, yayla culture has evolved on the Cilo and Sat mountains, and the summer migration of the colorfully clad local population to the high grazing pastures is a memorable event. Mountain glaciers and swiftly running rivers alive with fish and beautiful glacier lakes are a few of the area’s natural wonders. In the rainy and lush landscapes of northeastern Turkey, the Kaçkar mountains form the northern section of the Anatolian mountain chain. The Kaçkar_Kavron summit, at an altitude of 3932 meters, is the highest point in the range. Extensive glacier and water erosion have given these mountains their craggy, rugged look, and they are known for the complexity and power of the streams and rivers which rush down to the lower altitudes. In fact, this range is the third most important glacial region in Turkey following the Agrì (Ararat) and Cilo_Sat mountains. The geological and mountaineering aspects of the Kaçkars contribute to their importance in Turkey’s economy and tourism. The region enjoys an almost sub_tropical climate of temperate yet rainy weather with an average temperature of 14! C. The lowest temperature, 7! C., fall in the month of January while August sees the hottest days reaching a maximum recorded temperature of 22.6! 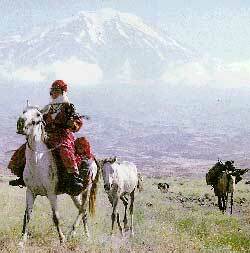 C.
The Kaçkars rise in between the shores of the Black Sea to the north and the River Coruh valley to the south. On the northern flank, a good variety of vegetation flourishes in the rainy climate. Up to 500 meters above sea level, tea plantations and citrus orchards cover the hillsides. Chesnut, hornbeam, beech and other large_leafed trees forest the slopes to 750 meters. Between 750_1500 meters of elevation, pines mix in with the large _ leafed trees forest the slopes to 750 meters. Between 750_1500 meters of elevation, pines mix in with the large leafed trees until gradually they remain the only species of tree from 1500_2000 meters. Alpine meadows and other grassy vegetation covers the ground above 2100 meters. On the southern faces of the Kaçkars, which receive strong sunshine and less precipitation, the agriculture is based on the cultivation of fruits and vines. As on the north side in the higher elevations, meadows of wild flowers and grass blanket the slopes up to 2300 meters. 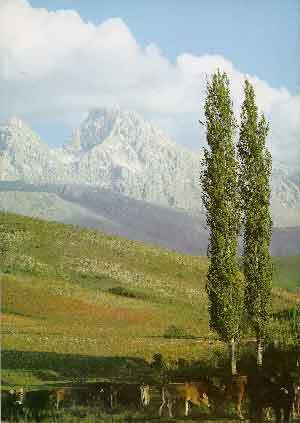 The Altìparmak, Kavron, Varsamba mountains are the principal peaks of the Kaçkars. Both the north and south faces of the Altìparmak and Kavron can be scaled but Varsamba should only be attemted from the north face. It is imperative to use a local guide when climbing the Kaçkars. The Toros Mountains are the western most branch of the great mountain chain that stretches across all of Asia – the Himalayan mountain belt. The Turkish section of this massive mountain range follows the southern border of Anatolia and it is made up of four major sections, the Western, Central, Southern and Southeastern Toros ranges. The highest peaks rises out of the Central and Southeastern branches, a stretch of mountains which are rugged, magnificent and arduous to climb. Forming part of the Central Toros range, the Aladaglar range runs from the southwest to the northeast for approximately 50 kilometers. It is between 25 and 30 kilometers wide and boasts the region’s highest peak, Demirkazìk which stretches to 3756 meters. Other high summits include Kìzìlkaya in the center (3725 m), a peak that reaches 3688 meters in the south and Mount Vayvay in the East (3565m). The long range is situated in the provinces of Nigde and Adana and rises between Lake Ecemis and the Zamantì river. The geological formation of the area is responsible for the interesting rock formations and waterfalls. The erosion of limestone has created a fascinating karstic topography and hydrography, especially in the Yedigoller valley, where karstic underground rivers and caverns collect the surface water. Both the Mediterranean and Anatolian weather systems influence the climate of the Aladaglar bringing warm summers and cool winters to the mountains. The best season to climb the mountains is during June, July and August when the alpine meadows of higher elevations are rich in vegetation. Researchers and mountaineers ascending the Aladaglar usually begin their climb from either Camardì or Cukurbag villages. 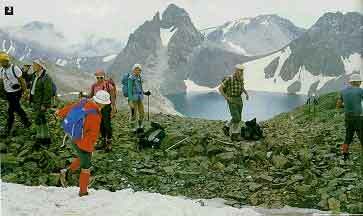 Those attempting to climb the Demirkazìk summit depart from Demirkazìk village. Both of these village lie 65 km from Nigde and can be reached by an asphalt road. The plateau, yayla of the Toros Aladag are the summer homes of entire villages and the summer grazing of herds of animals. Be sure to see the gathering in of all the animals for milking. Traditionally women of these encampment have produced some of Turkey’s most beautiful carpets and kilims, and it is often possible to see a carpet still in progress. One of Turkey’s most important mountaineering and winter sports centers, Mount Erciyes, rises from the south of the Kayseri valley. 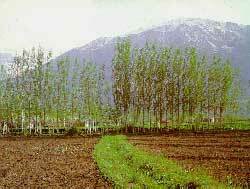 The Sultan Marshes lie to its west and to the south falls the Develi valley. Its summit always covered with snow and ice, Mt. Erciyes ranks as central Anatolia’s tallest volcano. Approximately 18 kilometers in diameter and covering an area of 1000 square kilometers, the mountain’s stratification and geology make it a fascinating geographical formation. The region’s climate, influenced by that of the Anatolian plateau is typical steppe. Winter brings considerable snowfall to higher elevations. The northern side of the mountain enjoys a more temperate climate encouraging the cultivation of vast areas of vine and fruit orchards between 1100 and 1600 meters. Above that altitude, expanses of meadows stretch far into the distance. The higher elevations display typical alpine vegetation. Herds of animals graze year round on the east, north and west slopes of the mountain. Mountaineers attempt Mt. Erciyes either on the northwestern flank or from the south and find the best climbing in June, July, August and September. Tourists visiting the area should also see the fantastic rock formations, underground cities and fabulous frescoes in rock carved churches in neighbouring Cappadocia. The Sultan Marshes, a habitat for many different species of birds, has been fortunately designated a national park and wildlife preserve. In fact, Turkey can boast of two peaks called Nemrut. The one near Adìyaman in the southeast is primarily of historical and archaeological interest, home for over 2000 years to the colossal stone heads of King Antiochus I and classical dieties. The other mount Nemrut in in eastern Anatolia, the more interesting of the two peaks, is well -known for its geological formation and for mountaineering purposes. An inactive volcano, Mt. Nemrut nearby Tatvan ascends to 3050 m. It is located within the process of Bitlis, rising from the southwestern shore of Lake Van, and entering the district of Ahlat to the north. Mt. Nemrut is the most southern and youngest of the chain of volcanos in the eastern Anatolia. A strato_type volcano, Mt. Nemrut began erupting during the fourth geological era and continued to be active untill 1441 A.D. As a result of the volcanic eruptions of Mt. Nemrut, the single Van – Mu_ river basin was divided into two separate basins. Treks up Mt. Nemrut begin on the mountain’s southeastern flank at Tatvan. Climbers reach the south or southeastern side of the crater after an easy hike for 4-5 hours. Those who reach this point have the rare chance to see the wondrous crater of this inactive volcano. For those who find the climb to the crater too strenuous, four-wheel drive vehicles can reach the summit from either Ahlat or Tatvan. Mt. Nemrut is bare of vegetation, except in the south which has oak groves and birch trees. Summer (June – September) is the best season for expeditions in Mt. Nemrut. Hikers who climb to the crater and summit from the southeast or eastern face of the mountain are rewarded with wonderful views of Lake Van. Mount Suphan, a magnificent dormant vocano rises from the north-west shores of Lake Van. Throughout the winter, snow falls on Suphan reaching three to four meters. The mountain’s steep slopes and snow blanket combine to make it a good location for “Heli-skiing” — using helicopters to drop you off on the slopes for an adventure of high mountain skiing. The easily accessible southern and eastern flanks of Suphan are the preferred faces for ascending the mountain; they both offer spectacular views. To climb from the eastern flank take the coast road that circles Lake Van. In the stretch between Adilcevaz and Erci, turn nort to Aydìnlar village. From there you continue on to Kìcgìllì village where you engage a guide to lead you in your ascent. The climb from the south begins at the village of Harmantepe. The western branch of the Toros (Taurus) mountains, the Beydaglarì range, is located in the province of Antalya. The crest of the range parallels the north-south line of the western shore of the Gulf of Antalya. The crest of the range parallels the north-south line of the western shore of the Gulf of Antalya. With altitudes ranging between 600 and 3086 meters, these mountains offer geologists and geographers many peculiar morphological characteristics. Tekedorugu, Bakìrlìdag, Tahtalìdag and Kìzlarsivrisi summits are particularly remarkable. The highest peak in the mountains is Mt. Kìzlarsivrisi (3086 m). Climbers reach the peak through the cedar forested Camcukuru valley. 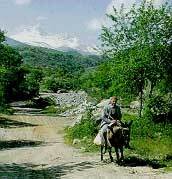 The best way to get to the valley is by road inland from Antalya to Elmalì. Antalya, of course, can be reached from Izmir,Istanbul and Ankara by land, air and sea routes. forests cover the slopes up to an altitude of 200 m. Bare meadows stretch to the summit. The climb up Mt. Tahtalì begins at Sogukpìnar, a short drive from Kemer. From there both walking and climbing bring you to a place for camping. The final ascent is carried out on the flank facing the coast and offers a spectacular and ever-changing view. Although it is possible to organize trips to Beydaglarì all year round, April, May and June offer both a temperate climate and a chance to experience the rich vegetation in the region. Continuing the line of summits in a southeastern direction, the Bolkar Mountains are bounded by the River Goksu to the west and the River Pozantì to the east. The northern part of the mountains lies in Nigde province, while the southern peaks rise in Mersin province. These mountains exhibit interesting geological characteristics. Made of sedimentary material such as limestone and dolomites, the range reveals excellent examples of nappes, or folds in the layers of rocks. There are vast formations of karst as well as landscapes that reveal the effects of glacier and water erosion. Despite this erosion, no water network has developed on the mountains. Because of the sedimentary nature of rocks, water is absorbed underground creating large areas of karst, such as Pozantì and Sekerpìnarì. The highest peaks of the Bolkar are: Medetsiz (3524 m), Kesifdagì (3475 m), Koyunasagì (3426 m), Tahtakaya (3372 m) and Egerkaya (3347 m). The north flank receives the most exposure to snow and glacier formation;it is nevertheless the best route for an ascent to the highest summits of the Bolkar. The northeastern extension of the central Toros (Taurus)range, the Munzur range straddles both the Tunceli and Erzìncan provinces. Mt. 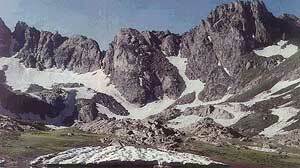 Akbaba, at 3462 meters, is the highest summit in the Mercandagì range. The limestone geological formation of these mountains creates a rugged profile. Erzincan, a major city north of the mountain range and accessible by air, rail and road, is the base from which an ascent on the northern face can be attempted. Those wishing to climb the mountain from the south begin their trek at Ovacìk in the middle of the Munzur mountains. Climbers entering from this point can reach the highest summits of the Munzur. Ovacìk lies 70 kilometers away from Erzincan and is accessible by a road which follows the banks of the Munzur valley. The River Munzur which rushes through a national park tempts tourists with fresh fish and beautiful mountain scenery. 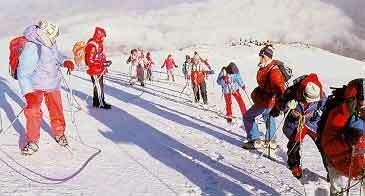 ATATURK UNIVERSITY, Department of Sports Mountaineering and Skiing Branch, Erzurum. ANKARA UNIVERSITY, Department of Sports Mountaineering Branch, Ankara. HACETTEPE UNIVERSITY, Mountaineering, Skiing and Outdoor Sports Club, Ankara. MIDDLE EAST TECHNICAL UNIVERSITY, Department of Sports Mountaineering and Skiing Branch, Ankara. 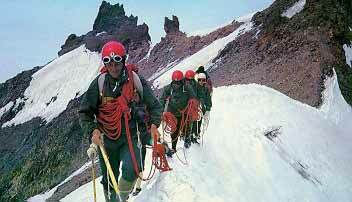 ERCIYES UNIVERSITY, Department of Sports Mountaineering and Skiing Branch, Kayseri. BOSPHORUS UNIVERSITY, Mountaineering Club , Bebek, Istanbul. YILDIZ UNIVERSITY, Department of Sports Mountaineering Branch, Yìldìz, Istanbul.